On the third Sunday of Advent St Luke gives us a glimpse into the personality of that wonderful person, John the Baptist. In your meditation, let him remind you of great people you have known. In verses 10 to 14 John speaks openly. Notice how he has a different word for each group which questions him. Notice too how the soldiers feel that even they can get a word of salvation. Verses 15 to 18 give us a further insight into the kind of person John the Baptist was. He may have said these words in a moment of discouragement, in which case they express his trust that God would complete what was lacking in his ministry. But perhaps they tell us of his humility in the midst of his extraordinary success as a preacher. Lord, we thank you for people who are direct and honest like John the Baptist. and those with something to eat must do the same. Lord, John the Baptist knew his people. and so too with the soldiers. Lord, we pray for the Church today. Lord, give us the humility of John the Basptist. 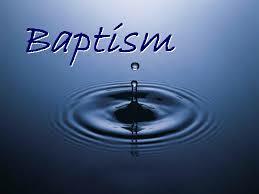 help us to declare before them all that we are merely baptising with water. and he baptises with the Holy Spirit and with fire. Lord, often we do not accomplish what we can because we are afraid of failure. and he will baptise with the Holy Spirit and with fire. with the whole of creation and all of our history. whereas we are your precious wheat which you will gather into your barn. 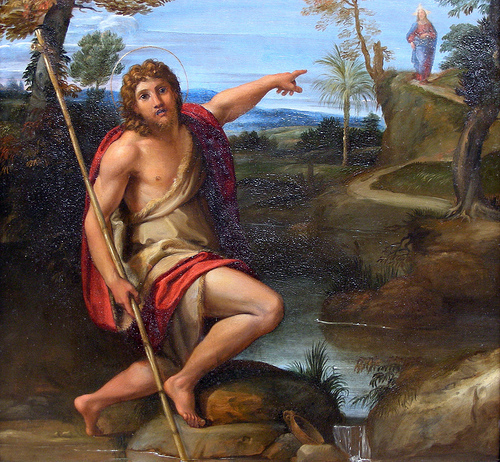 The figure of John the Baptist is seen as central to today’s liturgy and so we have this rarely read section from Luke. In all four gospels the work and preaching of the Baptist is seen as the divinely appointed preparation for the ministry of the Christ: Mt 3:1-12; Mk 1:1-8; Lk 3:1-19; and Jn 1:6-8. The presence of this precise theme preaching / preparing in all four gospels (distin from any other material they have on John the Baptist) show that this was a fundamental element in the kerygma: part hearing the good news of the Paschal Mystery is that the Baptist has prepared the way. It is to maintain continuity with structural element of the preaching that it is part of our liturgy to recall, indeed celebrate, the ministry of the Baptist on the Second and Third Sundays of Advent in all three years of the lectionary cycle. If we are going to celebrate the beginning of the Christ- event in the festivals of the Nativity, Epiphany, and Baptism, then we must have celebrated the work of the Baptist beforehand. Now that we have established the kerygmatic context of this gospel reading, we can look at the precise text in greater detail. Luke’s account of the preaching of the Baptist is by far the longest, and most of today’s passage is found only in Luke. The whole passage has as its central theme that the arrival of the Christ is at hand: he is already on earth and ready to pronounce judgement. The time of decision is not in some future time, but has started already for his ‘winnowing fork’ is in his hand. However, as part of the reaction to the presence of the Messiah — provoking this reaction from his hearers is the Baptist’s work of preparing the way — Luke has an ethical component: verses 10- 14 which are wholly without parallel in the gospel tradition. (3) soldiers — there can be no exploitation now. This ethical dimension in Luke’s presentation shows that while the early Christians were holding up the Baptist as a model to the churches, they also considered moral behaviour an essential part of their discipleship. This ethical aspect of welcoming the Christ in this gospel should be a spring board to some searching questions of each community about its own work in society to create the justice worthy of the coming of the Lord. Such ethical questions about Christian obligations to establish the just society are often forced onto the gospel text, but today it emerges directly as an Advent theme. *We must be people of hope’. *I am fed up with all the Christmas-hype’. 3. Two groups of five sound bites -and as sound bites we hear and use all ten of them – which are also tokens I symptoms of two radically opposed lifestyles, belief systems, visions of the universe. 4. The Christian vision involves, fundamentally, going out from the individual to the other: other people, society, the world in which we live, God. It ihvolves radically challeng­ing our selfishness and the belief that selfishness is the motor that makes the human world go round. We could imagine it as a picture of myself with arrows pointing outWards, then of our gathering for the Eucharist with arrows poihting out­wards, then of our society or the whole body of Christians and arrows pointing outwards from it. 5. The consumerist vision puts me at the centre of the universe AND all the arrows point inwards: have I got what I want for my happiness, have I got what I desire, am I satisfied, is there the amount of pleasure that I desire? Others only become in­volved in that we pool our selfishness so that we can have more fun together. The arrows point inwards and it does not matter whose labour is exploited so that I can have what I want – that is over the horizon and hidden from me. It is ir­relevant if others do not have enough to eat, have poor health care, suffer in ignorance for want of proper education, that I consume more of the earth’s resources than whole villages in the developing world. 6. But can we say that the Lord is near when we may contribute to a society that exploits the poor? Can we claim to be prepar­ing the way of the Lord while children die of malnutrition, while whole societies in sub-Saharan Africa are devastated by AIDS and are without drugs to stem its effects? Can we reo joice in the Lord’s coming while we simply find things bor­ing and seek new amusements but at the same time know that there are people in society who are in want? 7. Preparing a way for the Lord is simple, indeed a bit of fun, if it is just putting up the holly, doing the shopping, and maybe popping along to a Carol Service: but it is much more than that. is pointing the way to Jesus and that makes him a perfect role model for Advent. In the gospel John the Baptist describes Jesus as ‘standing among you, unknown to you’. In John’s time this was because Jesus had not yet begun his ministry, but in our own day these words have a particular relevance. We live by faith in Jesus the crucified and risen Lord present in our world. In preparing for Christmas we want to renew our awareness of that presence and to help others be aware of it. In Advent we, like John, are called to be witnesses to the light he brings. In small but important ways we can bring light into the lives of those around us. Simple acts of kindness, sharing our time, talents or resources with those in need, is the only way Christ’s light will shine for many people this Christmas. In our time, through the gift of the Spirit, the Word becomes flesh in us. This mid-point of Advent alerts us to issues of justice and equality. The prophet John has been asked as a sort of trick by people who exploited others with tax bills,, and soldiers who often used their brute force on others,, how they should repent. His words were tough but quite ordinary – don’t overcharge,, share your surplus with the needy and don’t exploit people. It’s another, but more figurative way, of stating the basic demands of ‘Love one another’. Christmas can bring out the best in us to care for the needy. We are surrounded by charities looking for aid. We know that Jesus hears the cries of the poor, and he joins every carol singing group trying to help. Christmas also asks us to consider our honesty and integrity, for we know that many are poor, at home and abroad, because of the greed of others. Christmas is a reminder and a challenge that all can live with the dignity we have come to regard as human rights – education, safety, shelter, food, water, employment, freedom. The Christ child who was born poor represents all the poor of the world, especially children. As he was bom ordinary, he represents that God meets, greets and helps us in the ordinary aspects of life. The one who is to come is the one who will live and love according to these truths of human dignity and equality. Today’s Gospel is Luke’s unique reporting of the themes of John’s preaching. The Baptizer is approached by two groups whose professions were scorned by the Pharisees: tax collectors, who usually made handsome profits by gouging their fellow Jews, and Jewish soldiers who belonged to the Roman peacekeeping force. John requires of them not a change of professions but a change of heart and attitude, that they perform their duties with honesty and integrity. John calls for selfless concern for one’s disadvantaged brothers and sisters. John assures his Jewish listeners that he is not the Messiah; in fact, John considers himself lower than the lowest slaves (only a non-Jewish slave could be required to loosen his master’s sandal strap and John does not presume to do even that). In proclaiming the Messiah’s “baptism in the Holy Spirit and fire,” John employs the image of a “winnowing-fan.” A winnowing-fan was a flat, wooden, shovel-like tool, used to toss grain into the air. The heavier grain fell to the ground and the chaff blew away. 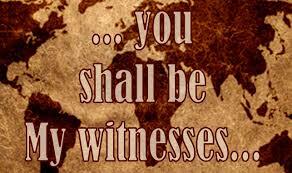 In the same way, John says, the Messiah will come to gather the “remnant” of Israel and destroy the Godless. Like John’s proclamation at the River Jordan, we are called to be witnesses of God’s love by the love we extend to others; precursors of his justice by our unfailing commitment to what is right and good; lamps reflecting the light of God’s Christ in our forgiveness, mercy and compassion; harvesters of souls through our humble and dedicated servanthood. As John proclaims at the Jordan, we can only celebrate the Messiah in our lives when we step beyond ourselves to embrace the needs and hopes of others. Every of act of compassion, justice and reconciliation is a sign of the “expectation” that “fills” every human heart for the coming of God’s kingdom in our time as well as in the time to come. Dietrich Bonhoeffer was a renowned Lutheran pastor, preacher and theologian. He was one of the most outspoken Christian voices raised in opposition against Adolph Hitler and the Nazis during World War II. His adamant resistance led to his arrest in April 1943 and his execution two years later. He was 39. “By the time you receive this letter it will probably be Advent, a time especially dear to me. A prison cell like this, in which one watches and hopes and performs this or that ultimately insignificant task, and in which one is wholly dependent on the door’s being open from outside, is a far from inappropriate metaphor for Advent . . . Uncompromising hope and unconditional love — from a prison cell, a young pastor proclaims the meaning of Advent. Christ comes to release us from the prisons into which our fears, doubts, cynicism and despair entrap us, his Gospel of compassion and forgiveness the keys to the cell doors. These days of Advent invite us to embrace the poverty of the Christ Child who comes, to realize that before God we are all “beggars” who have been given the gift of life, not because of anything we have done to merit it, but only because of the limitless love of God. In a spirit of poverty, in embracing Christ’s emptiness to become one of us, may we make of our homes and hearts a dwelling place for the God who comes with compassion that heals and peace that liberates. The Lord is near. Have no anxiety at all, but in everything, by prayer and petition, with thanksgiving, make your requests known to God. Then the peace of God that surpasses all understanding will guard your hearts and minds in Christ Jesus. That is the conclusion of our second reading for today, from Philippians 4. When Paul wrote this fledgling Christian community, it was facing persecution. “What will tomorrow bring?” they asked. They were anxious. Anxiety is the fear of the unknown. Paul tells them that their future is not a mystery, not unknown. Whatever happens, God will care for them. They needed to remember that God is in control. The Lord is near. They needed to pray to Him, and then trust in Him. Then, instead of anxiety, they will have peace, a peace that surpasses all understanding. On this Gaudete or Rejoice Sunday, we reflect on the Peace of the Lord. Jesus said in John 14:27: “Peace I bequeath to you, my own peace I give you, a peace which the world cannot give, this is my gift to you. Do not let your hearts be troubled or afraid.” The peace of the Lord is quite different than the mere cessation of hostility between warring countries....or relatives. The peace of the Lord refers to union with God. Think about it. We have peace when we are united to God, and turmoil when we are at odds with our Creator. We lose our peace when we allow sin into our lives. Sin itself is the opposite of God; it is chaos. But when we throw sin out, usually through a good confession and a determination to live for the Lord, we feel this overwhelming comfort, this warmth, this presence of God, this peace. Difficult situations will still crop up in our lives. Hard choices will still have to be made, but united to God, we can make these choices in peace. Nor can anyone, or anything take the peace of Christ from us. I have met, and perhaps you have met, dying people who knew their physical lives were coming to an end but also remained peaceful because they looked forward to full union with the Lord. I have met people who are overwhelmed with grief at the loss of a loved one, particularly a child, but who still clung to the Peace of Christ in the core of their being. About thirteen years ago, one of the greatest American bishops of the last century, Cardinal Joseph Bernardine of Chicago, wrote a little book telling about a false accusation made against him and about his dealing with terminal cancer. He entitled the book, The Gift of Peace. Get it, and read it. Nothing, no one, can take the Peace of Christ from us. But we can surrender it. We can trade it for the turmoil that is sin. We can give up our union with God so we can hate another person, or group of people. Or we can take a step away from God into the oblivion that the world says is normal behavior for a person our age, no matter what our age may be. For example, some people will celebrate Christmas, the birth of the Prince of Peace, by getting drunk and giving up their union with God, giving up their peace. They give up their core for the sake of that which is on the fringe of their lives. And for them, Christmas, the celebration of the Prince of Peace, turns into turmoil, a celebration of the prince of the world, the devil. Perhaps this might all seem like a weighty presentation for Rejoice Sunday. But our union with Jesus Christ is the source of our joy. We would not have this union had He not come among us as one of us, our celebration of Christmas. We would not have His Peace if He did not accept the results of our turmoil on the cross and then conquer death giving us His Life, our celebration of Easter. We have the greatest of all gifts. We possess Jesus Christ. Nothing else matters in this life, and nothing else of value will exist in the next life. We don’t know what the future will bring. But we are not afraid of the unknown. We are not anxious because we have the gift that surpasses the understanding of the world. We have the Lord. “Peace I give you,” the Lord said. He is the Prince of Peace. In the first reading the prophet Zephaniah invites the Israelites to shout for joy: “Rejoice, exult with all your heart, daughter of Jerusalem. The Lord has repealed your sentence. The King of Israel is in your midst; you have nothing to fear.” Christianity is a religion of Joy and if we are not happy Christians there is something wrong with our faith. Even when there is nothing in particular to rejoice about in our own lives, we can still rejoice that the Lord has been good to our fellow human beings, to our community, to our world. Those who seek will always discover the marvels the Lord has done and is doing for us. We rejoice because the Lord himself rejoices over us. We are his beloved in whom he is well pleased. Viktor Frankl in his book ‘Man’s Search for Meaning’ narrates how one day in the concentration camp, the Gestapo ordered him to strip. He obediently did as directed and stood before his persecutors stark naked but with his head held high. The only possession on his person was his wedding band. Walking up to him, one of the guards grabbed his hand and forcibly pulled it off his finger. Viktor sheepishly submitted –he just had no alternative. But even as he suffered this shameful indignity, he said to himself, “You can take away my wife, you can take away my children, you can strip me of my clothes, but there is one thing no person can ever take from me –and that is my freedom to choose how I react to what happens to me!” That was Viktor Frankl’s resolute determination and that was the secret of his ultimate victory. In his own words: “Happiness is a choice which ultimately transforms our tragedies into triumphs.”- No one takes away our joy and happiness! It is our choice! In the Gospel Luke puts before us the central figure of John the Baptist and his uncompromising message. We like to believe that God is all gentle and loving, that he accepts us as we are, and is ready to forgive us. But this can lead us to complacency. When John spoke to the people at the Jordan he confronted them and challenged them. He pointed out the way they needed to repent, to change. To receive the love of God, to let them be filled with Joy they had to get rid of the barriers that sin had created in their lives. 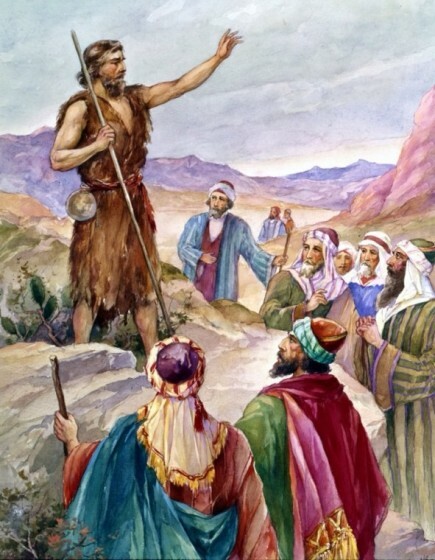 Moved by his clarion call the people asked him, “What must we do?” No doubt John the Baptist had a disturbing effect on the people when he showed up on the banks of the Jordan. Some people undoubtedly ridiculed him, others were angered by him, others deep down in their hearts knew that they were guilty of wrongdoing. All of us are guilty of some wrongdoing in our lives. “What must we do?” Admit our guilt and ask for forgiveness! A number of years ago the Dean of American Psychiatry, Dr. Karl Menninger, surprised a lot of people by writing a book called 'Whatever Became of Sin?’ He began it with a humorous but thought provoking story. One sunny morning in September 1972, a street preacher appeared on a busy corner of downtown Chicago. As office workers hurried by on their way to lunch, the street preacher would suddenly raise his arm, point a bony finger at an office worker, and shout, “Guilty!” Then he would stiffen up, pause a few moments and start over again. He’d raise his right arm, point his finger to an office worker and shout, “Guilty!” “The effect on the pedestrians was almost eerie,” said Dr. Menninger. They would glance at the preacher, look away, glance back and hurry on. John calls his hearers to common sense change. Anna Quindlen is a Pulitzer Prize author, and writes a biweekly column in Newsweek magazine. She has a new book – ‘A Short guide to Life’, in which she doesn't address people's finances and careers, her usual writing domain. Rather, while respecting people's need to work, develop their careers and put food on the table, she reminds her readers that a career is not our identity. She calls for developing meaningful relationships. She understands that many people must work two or three jobs for survival but, she says, there are a lot of people of comfortable means who have made work their identity and let their family relationships and friendships suffer as a consequence. She warns that one day these people are going to look up and notice that their lives are empty and significant people are nowhere to be found. Such modern voices are a warning similar to the one John addresses to his hearers. Look at your lives. What must be changed so as to put first things first? The Lord is near! 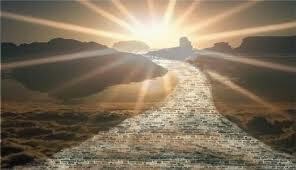 A guru once revealed the route by which he was led to God’s realization. “First,” he said, “God took me to the Land of Action and after many years to the Land of Sorrows.” He continued, “Then, I was taken to the Land of Love where I was emptied of everything, next, God took me to the Land of Silence, where I pondered the mysteries of life.” The impatient disciples asked, “What was the final stage?” The guru replied, “God finally said that I’d see God’s innermost self, and, God led me to the Land of Joy.” Jesus brings joy because he binds broken hearts and breaks captives’ chains. His joy will be ours if we too, in the power of the Spirit, help him free the broken hearted and captives. But this, demands breaking our own chains first. Are we ready? Todays reading from the Book of Zephaniah was written around 640 B.C. when Assyrian gods were being worshipped even in Jerusalem. Although most of Zephaniah is gloomy, here he presented hope, to reside in the remnant of the Jews that would remain faithful. 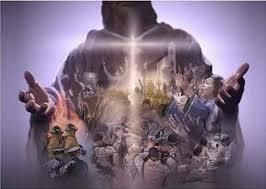 The city and the people are to rejoice because the Lord is coming to save them. Twice he states that despite sad things that are happening, God is in their midst. Paul in his letter to the Philippians asks them to be happy. I want you to be happy in the Lord always. What I want is your happiness. He asks them to be unselfish and keep away all worries, for there is no need to worry. If there is anything that we need we only have to ask the Lord who always answers our prayers. In every situation we should be thankful, in tears as well as in laughter. The experience of his peace which surpasses all understanding will guard our hearts. greed and ill-gotten wealth. The answer to the soldiers and the power-holders was that they should stop bullying, and blackmailing. All these questioners liked what they heard though the answers were blunt and forthright. This was good news that John gave them. Could he be the Messiah? of the Bridegroom, and to hand over the bride to him. John is the voice, Jesus is the Word. John is the lamp, Jesus is the light. Like John the Baptist we are not asked to be anything beyond ourselves. I am not and need not pretend to be the Christ, nor a great prophet. Our task is to offer ourselves to be his witness, his voice and his lamp. We are to recognize his presence within us. 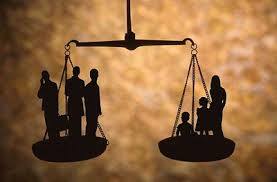 obligations of social justice, mutual support and charity in our particular circumstances and work. The many individuals who cast a first glance at themselves and accept to open themselves to the unforeseeable ways of god in the concrete reality of their daily lives become a people with a feeling of expectancy. What Should We Do? How Should We Live? There was a certain kingdom that had been blessed with kings who were both wise and good. The explanation was thought to lie in a magic ring, always worn by the oldest son who inherited the throne. But then a problem arose as the present king had twins, whom he loved equally. As he fell ill and thinking he was about to die, he hit on a plan. He got another ring made exactly like the first. Then he called his two sons separately and gave them each a ring. When one of the sons, Peter, found out that his brother had also received a ring he made a terrible scene. The king consulted a wise man to help him decide the issue. After examining the rings the wise man declared: I cannot tell which of you is wearing the magic ring. However, whichever of you displays the greatest amount of goodness in his life will prove beyond doubt that he possesses the magic ring. It was agreed. As it happened, the king recovered and after years when he was nearing his end, he called his sons to decide which one had the magic ring. Peter claimed he possessed it. But the people who knew him best thought differently. His wife said he had shown her very little affection and his children said he was never at home. His servants claimed he was hard on them and his neighbours complained that he was forever stirring trouble among them. When Paul came in he made no claims whatever of having the magic ring. The people who knew him said he was kind and they were full of praise for him. He proved a loving husband and a kind father to his children. He treated his servants with respect and he had been a force for peace among his neighbours. ascended the throne and donned the crown.  Our deeds witness to our lives. Once upon a time there was a little girl named Jeanne Marie who was afraid of the dark. She wouldn’t go to sleep at night unless all the lights in her room were on. You couldn’t never tell, she argued, who’d sneak into her room at night if it were dark. She absolutely refused to go into her closet because, like the boy in comics several years ago, she thought monsters might lurk in the closet especially at night. She claimed that she could hear the monsters talking about what they were going to do to her. Although she like snow, she hated winter because it was dark so much of the time. She didn’t like to go off to the country for vacation because there were no street lights and the dark was very scary indeed. The monsters who had hidden in her closet now wandered the streets of the summer village and lurked in the woods. She was frightened when she went to the movies because the theaters were too dark. Her mother said to her once aren’t you old enough now not to be afraid of the dark. She said, no, the older she got the more reasons she should think of for being afraid of the dark. She came home from school one day with the story of the midnight sun in Sweden in the summer. Lets live there, she said. But in the winter the sun hardly ever shines there, her mommy said. Well, where does it go. To the South Pole. Well, lets live there. It’s too cold. I don’t care, so long as it’s not dark. Then one day her mommy and daddy took her to midnight Mass in the church. It was totally dark inside. Jeanne Marie was terrified. Then the priest flicked the switch and the church was filled with light. Oh, said Jeanne Marie, it’s so pretty. Light always comes on, doesn’t it mommy? If you wait long enough. Patricia Greenlee tells a story about her son who is a West Virginia state trooper. Once he stopped a woman for going 15 miles an hour over the speed limit. After he handed her a ticket, she asked him, “Don’t you give out warnings?” “Yes, ma’am,” he replied. “They’re all up and down the road. They say, ‘Speed Limit 55.’” People have a tendency to disregard the warning signs, don’t they? Sometimes with dire consequences. Today’s gospel presents John the Baptist warning the Jews of the need of repentance and conversion with prophetic courage. A few years ago, a barge hit a support beam on the causeway going from Port Isabel to South Padre Island in far south Texas. As a result, a portion of the causeway plunged into the Laguna Madre. This all happened during the very early morning hours. Before any indication of this accident was conveyed to anybody, seven or eight automobiles drove through the opening and plummeted into the water several hundred feet below. Every person in those cars died. It took several hours before authorities on both ends of the causeway were notified and all traffic warned of the disaster and the tragedy. It was a horrible event. Even worse, business on the island suffered greatly, as this bridge was the only way for trucks, cars or vacationers to reach the island. Many were angry that plans needed to be canceled, businesses had to be shut down, and only ferries could be used to get to and depart from the island. Now if we had been heading for South Padre Island that morning, would we not have rejoiced that the warning was there and that we had been warned, not left to discover, tragically, the reason for the emptiness of the broken causeway? In today’s gospel, John is warning a "brood of vipers" that they have to repent and renew their lives, if they are to receive the long awaited Messiah into their midst. I once heard of a Christian speaker who declared rhetorically, expecting the answer "Yes"': "If you had two houses, you would give one to the poor, wouldn't you?" "Yes," said the man to whom the question was directed, "indeed I would." "And if you had two cars," went on the speaker, "you would keep one and give the other away?" "Yes, of course," said the man. "And if you had two shirts, you would give one away?" "Hey, wait a minute," said the man, "I've got two shirts." An elderly woman walked into the local country church. A friendly usher greeted her at the door and helped her up the flight of steps. "Where would you like to sit?" he asked. "The front row please," she answered. "You really don't want to do that," the usher said. "The pastor is really boring with his long Advent homilies." "Do you happen to know who I am?" asked the woman. "No," said the usher. "I'm the pastor's mother," she replied indignantly. "Do you know who I am?" the usher asked. "No," she said. "Good." Said the usher. waiting to be tortured and/or killed, waiting to die, waited in peace. And St. Maximilian Kolbe, the saint of Auschwitz, who asked that he be killed instead of Franciszek Gajownachek, a young father whom the Nazis had picked for execution, sat in peace in the starvation cell united to God, waiting to die. St. Margaret Ward also showed the courage of her conviction and the peace that union with Christ brings regardless of what was happening around her or to her. You probably never heard of her. I think it is important that we be aware of the heroic women of our Church as well as the heroic men. Margaret Ward was an English Catholic during the reign of Queen Elizabeth I. St. Margaret refused to tell the whereabouts of a priest she helped escape from prison. She was arrested and tortured. Then her captors pretended to be merciful and told her that this all would all end if she renounced her faith. With all these horrible things happening to her, she still remained at peace until they finally killed her. Her persecutors simply could not take the peace of Christ from her. And they tried with the viciousness of the devils they were. Soren Kierkegaard the famous philosopher of Denmark has a famous fable about geese. The geese in a certain farmyard decided to gather together every seventh day. At that time one of the ganders would mount the fence and preach to his fellow geese about their lofty destiny. The pulpit goose would recall the exploits of their forefathers and praise God for the gift of flight bestowed upon them. The congregation of fowl would flap their wings in hearty agreement. This routine happened every week. After each assembly the geese would break up and waddle to their respective places in the farmyard and eat the grain the kind farmer had scattered on the ground for them. On Monday morning the geese would chat about Sunday's sermon and discuss what might happen if they took to the skies once again. They might get lost or even worse, they might get shot. There was little doubt among them that the best thing was to linger in the farmyard with its security. The sermons would stir them and that was sufficient. It was good to hear what they could be and do as long as they need not do it or be it. All the while they didn't realize they were being fattened for the holiday tables of the farmer and his friends. That not only happened in a fable on fowl, but can happen all too frequently in a Church service on Sunday. The people were told simply what they must do. When John was through preaching, the people asked questions about deeds ... what they should do. They had been so guided in their thoughts that they were prompted by God's Spirit to do that which was pleasing to the Lord. William Willimon, Chaplain at Duke University, says that John the Baptist reminds us of boundaries we must respect and gates we must pass through. At Duke, Willimon reminds the students, "If you are going to graduate, you must first get past the English Department. If you are going to practice law, you must pass the bar. If you want to get to medical school you must survive Organic Chemistry." Likewise, "If you want to get to the joy of Bethlehem in the presence of Jesus, you must get past John the Baptist in the desert." The word from John is "repent," which means "about-face" or turning 180 degrees. Richard A. Wing, Deep Joy for a Shallow World. There is a story going around about a man who wanted to see and hear God. So he went out to a hilltop and yelled and pleaded with God. "Speak to me!" And a bird sang. And disappointed he again begged God to speak to him and all he heard was the sound of children playing in the distance. "Please God, touch me!" he cried and the wind blew across his cheek. And discouraged at not having his plea answered the man prayed, "God, show yourself to me!" And a butterfly flew across his path. And when he got home, convinced that God had forsaken him, his daughter ran out to greet him, but he felt abandoned by God. Now hearing a story like this, it is easy to see God. But in this story this man was as certain about what it means to see and hear God as we are about the end of the stories we heard today. Once the eminent philosopher John Dewey found his son in the bathroom. The floor was flooded and he was mopping furiously trying to contain the water in that room, keeping the damage to a minimum. The professor began thinking, trying to understand the deeper ramifications of the situation. After a few moments, the son said, "Dad, this is not the time to philosophize. It is time to mop!" Baptism is our statement that we are ready to stop philosophizing and ready to start mopping. Zig Ziglar reminds us that the largest locomotive in the world can be held in its tracks while standing still simply by placing a single one-inch block of wood in front of each of the eight drive wheels. The same locomotive moving at 100 miles per hour can crash through a wall of steel reinforced concrete five feet thick, but it must be moving first. In John Steinbeck's story "The Wayward Bus" a dilapidated old bus takes a cross country shortcut on its journey to Los Angeles, and gets stuck in the mud. While the drivers go for assistance, the passengers take refuge in a cave. It is a curious company of people and it is obvious that the author is attempting to get across the point that these people are lost spiritually as well as literally. As they enter into this cave, the author calls the reader's attention to the fact that as they enter they must pass a word that has been scrawled with paint over the entrance. The word is repent. Although Steinbeck calls that to the reader's attention it is interesting that none of the passengers pay any attention to it whatsoever. All too often this is our story. Yet, John the Baptist calls upon us to take our sinning seriously. Why? Because God does? Repentance is not just changing our minds, or feeling sorry for something that we have done, or even making bold resolves that we will never participate in certain conduct again. Instead, repentance means to turn around and go in another direction. What John the Baptist wanted his audience to hear was: Turn your life toward this one called Messiah. This is not negative or down-faced. Rather, it breaks the chains of oppression and death that hold us back. A few years ago as the world watched the beginning game of the World Series in San Francisco there was suddenly an interruption of the opening interview. The screen blinked and went blank. When the program resumed: A Special News Bulletin. The San Francisco metropolitan area had experienced a serious earthquake. We all watched the live pictures as the huge fire in the Marina area burned. A remote camera crew was there and we saw the firemen fighting the fires. The scene I remember the most, however, was a group of people standing around just looking at the destruction and looking at the fire. All of a sudden a cop came up to the crowd and yelled out to them: What are you people doing just standing there. You must get prepared immediately. Go home and fill your bathtubs up with water. Be prepared to live without city services for 72 hours. The sun will set in another hour and your time is running out. Go hence and get prepared. A long, long time ago a man came on the scene by the name of John the Baptist. John's message was not told in soft monotones, but rather there was an urgent screaming in his voice. "Why are you not getting ready?" he yelled to the Hebrews. Why are you just standing there. Don't you see that your time is running out on you. You need to be preparing the way. Making the path straight. Go and get ready. That message may sound very strange to our modern ears, but the simple truth is that is Jesus were standing here in the flesh this morning and we asked him to give a list of the preachers who were most instrumental upon him, he would have listed the name of John the Baptist. There is just simply no question about that. There was no single human being who was more influential upon the life and career of Jesus than John. Some years ago a military airplane crashed at Sonderstrom Air Force Base in Greenland. Twenty-two people were killed. The runway and the nearby fields were strewn with bodies. It was a tragic and horrible moment. There was only one chaplain on the base at the time... and the entire burden was laid on him to bring comfort and the Word of Christ to a shocked community staggered by the horrendous accident. But there was little time to mourn that day. The grisly task of gathering up and identifying the bodies needed to be done. And so, the chaplain, along with a young lieutenant who had been assigned the duties of a mortuary officer and a group of volunteers went about the awful business of picking up the mutilated bodies and trying to identify the dead, so that their families and loved ones back home could be notified. It was a heart-breaking and exhausting task, but it had to be done. The people worked in shocked silence well into the night until they almost dropped from fatigue. When every last remnant of death had been picked up, they each went silently to their individual rooms. That night, after midnight, there was a knock on the chaplain's door. Outside stood the young lieutenant, the Mortuary Officer. He said nothing. He just stood there and wept. After some moments, the young lieutenant spoke through his tears and he said to the chaplain, "As we were picking up the bodies today, I realized something. I realized that the only other people out there with us were the people who go to church here. I have always been an unbeliever, and I used to ridicule these same people who were out there with us. Yet they are the only persons who would, or perhaps could, do what we had to do today. It must have been their Christian spirit that could help them see beyond the horror to the hope." That tragic day turned around the life of that young lieutenant. As he had admitted, he had never been religious, had seldom gone to church except for weddings and funerals, but from that time on he was a new man. Christ was born in his heart. From that time forward, he took an active part in the Christian ministry of that base. Then he did an unheard thing - he extended his tour of duty in Greenland for an extra year. He was the first person in the history of that base to do that. He did it because he wanted to be able to tell others the story of how the power of the Christian Hope had changed his life. If you want to give your loved ones a great Christmas present this year, give them the gift of Christian Hope. On page after page of the New Testament we find it: the Good News that God will win, that nothing can defeat Him; that ultimately God and goodness will have the victory and that when we put our hope in Him, nothing, not even death, can separate us from His watch care and His love and His triumph. Once each year, Christmas comes along to renew our hope and to remind us that the darkness of this world cannot overcome the light of the world. Blessed are they who find Christmas in the age-old story of a babe born in Bethlehem. To them a little child will always mean hope and promise to a troubled world. Blessed are they who find Christmas in the Christmas star. Their lives may ever reflect its beauty and light. Blessed are they who find Christmas in the joy of giving lovingly to others. They shall share the gladness and joy of the shepherds and wise men of old.